Not all these McCULLAs, McCULLOHs, or McCULLAGHs or what have you are known to be related. I have assembled this table as a first step to determining what if any relationships there may be between those McCULLAGHs who lived in Antrim, Armagh, Monaghan and Down. NOTE: In my family tree, I have recorded most of the variant names as McCULLAGH (including McCULLA, McCULLOH, McCULLOGH etc). It makes them easier to track, and sometimes several spellings of the surname are included in a single document. NOTE: Many people mentioned are in my old Rootsweb tree which has not been updated since Ancestry stopped access for revisions in December 2017. Updated January 16, 2019. Memorials added - see shaded cells for new additions. Updated January 25, 2019. ADDED: Location of Piedmount. McCULLAGH connections - A work in Progress. June 2016. The 1777 Taylor & Skinner's Maps page 17 identifies Paymount (aka Piedmount) as O'NEILL's. · Jane COULTER (b 1700), daughter of Thomas COULTER & Anne MAFFETT of Lisnawooley, Co. Louth, married a William McCULLA aka McCULLAGH, probably in the 1720s. They had three sons: Joseph, William & James. NOTE: I have entered them in my Rootstree database. Was this William McCULLAGH a son of one of the three brothers: William McCULLAGH, Samuel McCULLAGH and George McCULLAGH who held land at Cloghogue, Co. Armagh in the post 1640s? · Jane OLIVER, daughter of William OLIVER (1730-1816) & Elizabeth STEEL, married a John McCULLAGH (?-1818) of Kearney Hill. He descends from a line of McCULLAGHs from Clady [aka Cladymore & Cladybeg], Parish of Kilclooney, Co. Armagh (it is on the eastern border of Lisnadill). That line goes back to a John McCULLAGH (?-1787), although deeds record the family there as early as 1740, and naming patterns suggest a connection between them and the McCULLAGHs of Antrim. Benjamin OLIVER, brother of Jane OLIVER brother leased 55 acres in the townland of Killynure. In 1879, A John McCULLY leased 5 acres in that townland, and the descendants of both families continued to hold land there up until at least 1929. The geographical proximity of the intermarrying families of OLIVERs and McCULLAGHs continued for at least 300 years. SOURCE: Revision Books. · An extensive line of descendants of Alexander McCULLAGH (1585-1682) of Antrim connects to McCULLAGHs of Grogan, & Piedmount & the Town of Antrim in Antrim, as well as Rahans in Co. Monaghan. NOTE: I have entered what I have of them in my Rootstree database. They are part of the Carrickmacross lace connection – Dorothea Beresford REED née McCULLAGH and her sister Anne. · James McCULLAGH (1740-1840) of Derryvalley, Co. Monaghan fathered Elizabeth McCULLAGH (1788-1880) - grandmother of an Elizabeth McCULLAGH who married John JACKSON of Liscalgot), James McCULLAGH & Thomas McCULLAGH who had farms and businesses in Monaghan. · The McCULLAGHs who married WALLACEs. NOTE: Was the William McCULLAGH (1814-1869) who married Sarah WALLACE (1821-1867) related to the John McCULLAGH of Dundalk who married her sister Anne Jane WALLACE (b 1819)? Were they both sons of the William McCULLAGH (1738-1817) and Hannah FAULKNER (1757-1827) of Dundalk? · A McCULLAGH Freeholder Records table is on my web site. Of interest is the presence in 1818 of both Alexander and Samuel McCULLAGH at Clohogue, where three earlier brothers had land grants more than a 100 years earlier. · Peter McWilliam has a listing of McCULLAGH deeds on his Treasure Your Exceptions web site. · There are other deeds for which I have simply reference, and not much if anything in the way of notes. They can be accessed on my List of Deeds page. · Ros Davies has pages of McCULLAGHs in Co. Down. McCULLAGH A-J; McCULLAGH K-W; and McCULLY. · 1654 The McCuilaghs, a Scottish or English family, had obtained a substantial portion of the 30,000- acre estate of Sir Henry O'Neill of Glassdrumman, when that family was transplanted to Bohola in Co. Mayo, in 1654. They owned land in Co. Monaghan and in Co. Armagh and they built a scutch-mill (as well as several other mills) on the River Fane, at the bottom of "Corismood". SOURCE: Cullaville Con Mac an Ghirr. Published in Creggan: Journal of the Creggan Local History Society, 1990 pg 60. Culloville was likely named after them. · 1641. With respect to holdings in Antrim, the 1641 Down Survey maps show 401 Plantation acres held by Henry O’NEIL (Catholic) in the Parish of Skirreocavan, Co. Armagh which were then shown on the 1670 map as being transferred to Randall MacDONELL, Earl of Antrim (Catholic). He was the Catholic landlord who “planted” the largely uninhabited parish of Creggan in Co. Armagh with Presbyterian farmers in the late 1600s, early 1700s. · After 1641: Three brothers: William McCULLAGH, Samuel McCULLAGH and George McCULLAGH and their brother-in-law John BROWN held part of townland of Cloghog. SOURCE: Account of the Barony of Upper Fews John Donaldson. Creggan Local History Society, 1993 p14. · Grogan is in the Parish of Dummaul, Barony Upper Toombe, Co. Antrim, as is Randalstown & Shanes Castle Park. https://www.townlands.ie/antrim/groggan/ The Prouty website locates it: Groggan is a small village, more like a crossroads, about 4-5 miles northwest of Randalstown in Drumaull Parish, County Antrim, Northern Ireland. The map of Groggan Co., Antrim shows Groggan near the left hand edge, Drummaul near the left center top, and Randalstown is the shaded town area indicating a larger town at the left of center on the bottom edge. Another possibilty is "Gortgarn" or "Gortagharn", both townlands in County Antrrim, Randalstown district of the Upper Toome Barony. INSERT MAP Source: Groggan on Google Maps. · Piedmount aka Paymount aka Paymont Co. Antrim. It is situated between Randalstown and Toomebridge, Co Antrim. on the Gloverstown Road near Duneane Presbyterian Church. SOURCE: Nov 18, 2018 email from Linda Houston. · Camly Macullagh, Parish of Newtownhamilton is a townland of 1029 statute acres 2 rood and 29 perches about two miles south of the town of Newtownhamilton. In the Tithe Applotment Books of 1825 the total area of the townland (Camoly McCullough) was recorded as 522A, 3R 10P (Plantation Irish measure.). By the time of the 1837 Census, there were no McCULLAGHs living here. · Clady. Aka Claymore, Parish of Kilclooney and/or Mullaghbrack. NOTE: I am guessing that the original parish was split in two. In the older deeds, the parish is recorded as Mullaghbrach, which is on the northern border of Kilclooney. 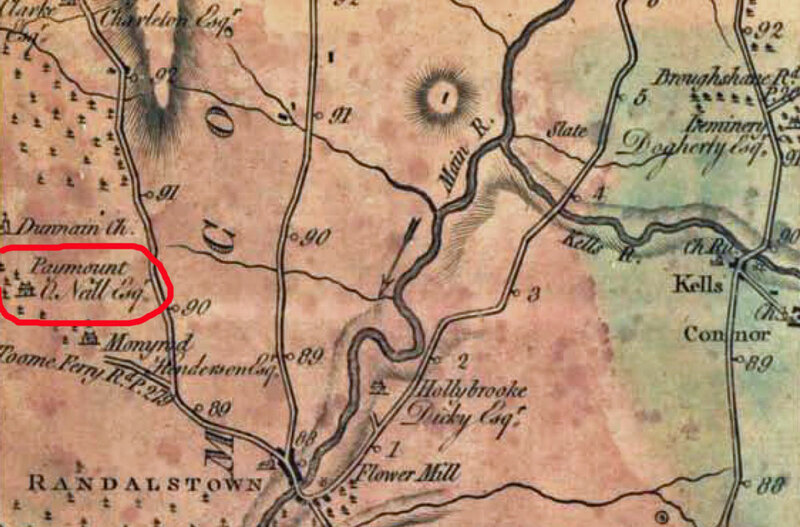 In contemporary maps, the townland is recorded within the parish of Kilclooney. · Edenknappagh. Parish of Lisnadill, Lower Fewes., In the 1665 Hearth Money Rolls, a John McCULLAGH was recorded, but the number of hearths was not noted. · Tyrawlyy. Aka Tirearly, Parish of Lisnadill. In the 1665 Hearth Money Rolls, a John McCULLAGH occupied a house with one hearth. Update January 16, 2019. Added a few more memorials from Books 1-75. Deeds and other bits by year. Later Scots-Irish links, 1525-1725 Part Three. McCULLOUCH, James, in Drummorrell, Wigtonshire, applies for 2000 acres in Ulster on 18 July 1609, [PU#140]… also Donegal. John McCULLOCH of Town of Antrim Surgeon and Apothecary.. wife Margaret McCULLOGH or SHAW… part of the tenement which I now occupy with the lower part of the back house now occupied by Mrs. NIXON and the Stable called my own stable with the loft over it for offices with one cows graizing on the land which I hold with said tenement… son William McCULLOCH… daughter Dorothy MORTON or McCULLOCH left shop and utensils in tenement in Antrim now occupied by her husband Mr. John MORTON and her with the backhouse they now occupy… daughter Victoria JACKSON or McCULLOCH – rents of tenement now occupied by Mrs. NIXON with the house called my turf house and loft above… and if she shall have lawful issue…… daughter Jane WALKER… tenement now occupied by James MALONE at end of Massareene Bridge to daughter Jane WALKER or McCULLOCH… Cabins in Bowlane… there was 350 left by my late father-in-law Captain McCULLOCH on his estate in trust for my late wife & me over which I was to have distributive power to our issue and one hundred pounds was left to myself by Captain McCULLOCH and whereas there is an unsettled amount between William McCULLOCH Esq. my brother-in-law in whose hands Capt. McCULLOCH’s estate now is, I request he may settle…… son Henry McCULLOCH viz Margaret… profits to my sister Elizabeth M’KINLAY or McCULLOCH… granddaughters Margaret and Jane (presumably not children of Victoria) … John KERR & Robert YOUNG Postmaster to be executors NOTE: I suspect that I have a transcription error, and that Capt McCULLAGH is his father not his father-in-law. NEED to check. John O'NEILE, Donoghmore, James McCULLOCH & Henry McCULLOCH, Co Antrim, Esqs, trustees by Act of Parliament, to Joshua DAWSON of City of Dublin. Eight Townlands of Mayola lying and being in the Parishes of Ballyscullin, Artrea and Magherafelt in the Barony of Loughinsholm in Co Londonderry, viz. Mayola, Aghrim, Mayola, Tauniaran, Leitrim, Derrygarave, Ballymaguiggin, Shanemullagh, Anaghmore als Drumrascombe & Devenish called Coney Island £6500 8 townlands in By Loughinsholin, Co Londonderry, for £6500. Widow McCULLAGH was an occupant of Killileagh, Co. Down. Re property near High Street in town of Killileagh. Occupant: James McCULLAGH of Lazy Hill, deceased. NOTE: He was not described as deceased in an earlier deed in 1708: ROD 2-228-425. Patrick McCULLAGH of Dublin City, Merchant witnessed deed. Lease between Richard RUCKMAN of Cork Street at Dolphins Barn Lane – Co. Dublin and Joseph JACKSON (same address) weaver. House signed over to JACKSON. William McCULLAGH of Dublin, Merchant of “Magpie House”? “All that the Corner House in Cork Street over against the house called the Magpie House [aka Magpye] leading from the Street to Ropers Rest Home on the North Side the said lane with the Backside behind the said house and the little house in the Backside called the Limekilnhouse … lives of Henry PERCY, Robert PERCY & John[WOOD? ]” WITNESSES: Benjamin JOHNSTON & Charles MEARES clerks to Edward DALTON Public Notary in Dublin. NOTE: There are earlier references to Magpie House in the Deeds Registry. William McCULLAGH witnessed will of Josua WILCOCKS. NOTE: Abel STRETTEL was the executor. Btw Thomas M’CULLY Taylor & Ann POTTS als M’CULLY wide of the sd Thomas of the 1 pt & James WORRALL of same city Clerk of other pt…all that or those the Brickhouse or tenement on Kings St in Oxmantown in Parish of St Michans bounded on the north to Kings St afsd on the south by a wall belonging to Robert SHAPCOTT Esq. on the west by a stone wall belonging to the sd Robert SHAPCOTT on the east by a brick house belonging to George CLAPHAM Clk. Containing in front towards Kings St 54 feet or thereabouts on the south 42 or thereabouts on the west 54 or thereabouts and on the east 65 feet or thereabouts..
James McCULLAGH & William McCULLAGH (intended groom) to Patrick AGNEW, Gent of Killwaghter Antrim; John SHAW, Gent of Bush, Antrim; Clotworthy UPTON Esq of Castle Upton, & Dorothy Beresford SHAW, spinster & intended bride & daughter of Margaret SHAW, widow of Ballgelly, Antrim; relict of William SHAW Gent, late of Ballygelly; dec'd in trust of lands in Fewes (bar.) Armagh: Rackland-23a 14p Crewkyrer-205a 2r 38p Lifsary ats Lifswary-80a Cornecery-71a Carricanony-109a Mongeleagh-86a Glafsdrumenagh-86a 2r 12p Car?onloagh [357a 2r 34p] Ballyvallon; in Toom (Bar.) Antrim: Ballygrogan Ballydrunuall Ballyhenulla Monyrod Ballydonnellan Ibragh & 1/2 townland of Cloonkeen with corn mill & mills standing & Derryhullagh & Balymatoskerty with grist mill. Other names: John SHAW, Gent of Antrim; Robert DONALDSON, Gent of Dublin City. WITNESSES: James STEVENSON, Esq of Killeleagh, Co. Down; John McCULLAGH, Gent of Randalstown, Co. Antrim; James BLAIR Esq. of Blairmount, Co. Antrim; James GREER, servant to William McCULLAGH; Alexander HUTCHESON, clerk to Robert DONALDSON. Notes thanks to Michael Stewart. NOTE: This means they are connected to the McCULLAGHs of Cullaville – same landholdings. James McCULLAGH & William McCULLAGH (intended groom) to Patrick AGNEW, Gent; John SHAW of Bush Co. Antrim Gent; & Clotworthy UPTON of Castle Upton, Esq. & John SHAW of Antrim, Co. Antrim Gent in trust of lands in Fewes (bar.) Armagh: Rackland-23a 14p Crewkyrer-205a 2r 38p Lifsary ats Lifswary-80a Cornecery-71a Carricanony-109a Mongeleagh-86a Glafsdrumenagh-86a 2r 12p Car?onloagh [357a 2r 34p] Ballyvallon; in Toom (Bar.) ANT: Ballygrogan Ballydrunuall Ballyhenulla Monyrod Ballydonnellan Ibragh & 1/2 townland of Cloonkeen with corn mill & mills standing & Derryhullagh & Balymatoskerty with grist mill. Dorothy Beresford SHAW intended bride, daughter of Margaret SHAW of Ballgelly, Co. Antrim widow of William SHAW late of Ballgelly, Gent deceased. Robert DONALDSON of Dublin City mentioned. WITNESSES: James BLAIR of Blairmont Antrim, Esq. ; James GREER, servant to William McCULLAGH; Alexander HUTCHESON, clerk to Robert DONALDSON; John McCULLAGH, Gent of Randalstown, Co. Antrim. Thanks to Peter McWilliam. DATE? My mistake – I didn’t record it. BTW James McCULLAGH of Camley, Co. Armagh Esq. & William McCULLAGH of Dublin Merchant surviving executors of the last will and testament of William McCULLAGH late of Piedmont in Co Antrim Esq. deceased of the 1st part. .. lots of other names and townlands – ran out of time! SEE: 23759. Walter PETERS leased to William THWAITES garden ground late in the possession of William McCULLA on the west side of Drumcondra Lane, suburbs of Dublin, for 79 years. Witness: William McCULLAGH of City of Dublin, Merchant. WITNESS: William McCULLAGH of Dublin City, Merchant. WITNESS: William McCULLAGH, merchant of Dublin. James M’CULLOH, merchant of Belfast to William M’CULLOCH of Grogan Co Antrim… lots of lands mentioned. Between Wm McCULLOCK of Lisnegraggan and Co Antrim & Adam DICKY of Ballydonlane & Co Antrim Linnen Draper.. Upper quarter of the half townland of Ballydonlane. Witnesses: John COOK, Taylor; James COOK, linnen draper; John BROWN, linnen weaver all of Ballydonlane and John McCULLOCK of Lisnegraggane Gent. Marriage agreement – Grace PERCIVALL & John McCULLAGH. Parties: John McCULLAGH Jnr. of Killiegh, Kings Co, Elizth PERCIVALL of Dublin, widow of David PERCIVALL merchant of Dublin, decd, Grace PERCIVALL dau of Elizth & David. Between James McCULLOH, merchant, Belfast, Saml McCLINTON, Vintner, Belfast & Wm McCULLOGH Esq, Paymount [Piedmount], Co Antrim to Jno WORTHINGTON. Messuage of tennement in High Street Belfast commonly known by the Sign of the Crown. Between James McCULLOH of Belfast, Co Antrim Merchant of 1 pt & Wm McCULLOCH of Piedmont Co. Antrim Esq of 2nd pt. refers to lease by Rev John HAMILTON of Ballgraffin, Co. Down & lease of Aghohill as formerly held by John O’NEIL.. in consideration of 750 pounds. Marriage agreement – Grace PERCIVALL & John McCULLAGH. NOTE: It said 1726, but I believe that was the old calendar date, therefore 1727. James McCULLAGH of Belfast merch of 1 pt transferred to Isabella NEIGHANS, spinster, for 236 pounds land in the North side of High St.
Thomas MORRIS of Marlybone Lane, Co. & City of Dublin, brewer of 1 part & Edward McCULLAGH of City of Dublin, Gent of the other. Between Michael SHIMIN of City of Dublin, Cordwinder of 1st part & John McCULLAGH of Killiegh, Kings Co. Gent of 2nd part ...lands in Dublin. Marriage Contract between John STEEL of Kenbelly of one part & Susanna McCULLOGH of other part. WITNESS: John DAVISON of Knockburn[?] malster & George McCULLOGH of Eglish, yeoman, Co. Antrim .... and then April 16, 1752 ... signed and sealed by Susanna McCULLOGH otherwise STEEL, widow and relict of said John STEELL in presence of John DAVISON & James MOORE of Ballymena, Co. Antrim, Gent (reference to High Court of Chancery in Ireland). James McCULLOUCH of Parish of St. James, Westminster, Co. Middlesex. Hugh McCULLAGH of Lisky, Parish of Camus, Co. Tyrone, Gent & Rebecca his wife of the one pt & Wm SINCLARE of Barney, Parish of Camus, Co Tyrone...demised new house. Hugh McCULLAGH of Liskey, Parish of Camus, Co. Tyrone & Rebecca his wife & John McCULLAGH, their only son. Lands in Strabane witness: Hugh BROWN of Strabane, Co. Tyrone. James McCULLOH of the City of Westminster & now of City of Dublin Esq. of the 1 pt… lands of Cruisreath Parish of Mullnahudden, Barony of Castleknock, Co Dublin. NOTE – enter earlier ones from Westminster. Hugh McCULLAGH, Strabena, Co. Tyrone Innkeeper. Matthew McCULLA of Parish Dundalk, Co. Louth. Occupant of house in middle Ward Dundalk, Co Louth. Registry of Deeds, Abstracts of Wills. Probated 13 May 1745. His wife Mary McCULLOH otherwise Ferguson. His nephew Mr Wm. McCULLOH. His eldest daughter Margt. McCULLOH. His second daughter Jane McCULLOH, James Stewart, Co. Antrim, Esq., and Charles MACARTNEY, Dublin, merchant, trustees. To James MACARTNEY son of said Charles MACARTNEY £300 when 21 years. Alice BOWKER of the Kingdom of Great Britain. His servant Alice BOYCE £100 for her faithful service. James McCULLOH of Piedmont, Co. Antrim, Esq., and his said nephew Wm. McCulloh exors. His real and personal estate. Witnesses: John TREANOR, Dublin, Edmd. WALL, Dublin, gent. Paschall WILSON, Dublin, scrivener. Memorial witnessed by: Paschall WILSON, William BIGGER, Dublin, gent. William M’CULLOCH of Kilmore in Co. Antrim of the one pt & Joshua M’GEOGH of Armagh of the other part. Reciting that James M’CULLOCH of Piedmont, Co. Antrim Esq. deceased reciting deed Feb 18, 1744 granted let and set to Thomas TIPPING late of Castletown, Co. Louth since deceased….lands of Tullyallen Cunningham cont 80 acres or thereabouts, Barony of Fews, Co. Armagh…Feb 18 1744 set to Joshua M’GEOUGH set lands of Tullyvallen Cunningham 109 acres 1 rood 18 perches WITNESS: Daniel BROWN attorney at Law, Dublin & Dorothea M’CULLOCH. Between Randal DONALDSON of City of Dublin, Esq of the 1 part Thomas TIPPING of Castletown, Co. Louth, Esq. James McCULLA [otherwise McCULLOCH] of Peymount [Piedmount], Co. Antrim Esq. & Alexander McCOMBE of Altnamoy, Co. Antrim Gent of the other part .... DONALDSON granted to Thomas TIPPING, James McCULLA & Alexander McCOMBE part of Freeduff whereupon the dissenting meeting house lately stood ... 1 acre, yearly rent of 1 peppercorn. WITNESS: Thomas KENNEDY & Robert MURRAY both of City of Dublin, Gents. NOTE the variant spellings within the same deed – this has to do with the Presbyterian Meeting House at Freeduff. Reciting James McCULLOCH, Esq. of Piedmont of 2nd part had mtg sd lands unto James ROSS, Merchant of Belfast of 1st pt for £2000 to which lands James McCULLOCH was entitled to for lives renewable forever, James ROSS with consent of James McCULLOCH assigned over sd lands to Henry MITCHELL Esq. of Dublin City for £2000 to hold for natural lives of James McCULLOCH William McCULLOCH & Thomas TIPPING, subj to redemption. Deputy Registrar: James SAUNDERS. WITNESSES: Robert CARSON, Gent of Dublin City and Robert RAY, Gent of Dublin City. 1747 Jan 10 NOTE: The same date as above may be significant. Francis WEMYS, Esq deceased & Mary McCULLAGH o'wise WEMYS, widow & executor of Francis WEMYS & Henrietta WEMYS daughter of Francis & Mary WEMYS of 1st pt 6 acres Drumcondra Lane on Great Rd from Bolton St, town of Drumcondra, co Dublin. A Memorial of an indented deed of lease bearing date 13th Jan 1727-8 made between Gervais WALKER of Kilmacrew in the Parish and County of Armagh Gent of the one part and William McCULLAGH of Ballynahonemore in the said Parish & County farmer of the other part. Whereby the said Gervais WALKER for the consideration of £50 to him the said Gervais in hand paid by said William McCULLAGH all that the quarter part of the south ward of the townland of Ballynhonemore aforesaid in the Parish and County of Armagh as then formerly held by James NEILSON Deceased & John WAGH containing by estimation 100 acres English measure ... term of 19 years rent of £12 Ster. [NOTE a sub lease from the Lord Archbishop of Armagh with rights of renewal]. Witnesses George WALKER now of Newry, Co. Down & James DUNLAP of Drumkirk of Co. Armagh Adam DUNLAP decd [this is confusing] Hugh CUMING of Kerneyhill, Co. Armagh & Alexander McCULLAGH of Ballynahonemore NOTE: This is interesting because of the connection between WALKER & McCULLAGH – and also land close to where the John McCULLAGH of Clady who married Jane OLIVER lived at Kearny Hill. See: November 14, 1747. William McCULLOCH, intended groom £500 portion from Charles McCARTNEY, merchant, uncle to Alice COLEMAN, spinster. Deputy Registrar: James SAUNDERS. WITNESSES: James McCULLOCK, Esq. of Piedmont; Elinor TRIDELL, then of Dublin, now of Bristol, widow; Margaret McCULLOCH, Spinster, then of Dublin, now of Bristol, & James GALLOWAY, Yeoman of Dublin City.. NOTE: This is the William McCULLAGH (1721-1800) son of Dorothea Beresford SHAW & William McCULLAGH. Between Grizel McCULLAGH of Cullinbragh widow & relict & Archibald McCULLAGH late of Cullintragh Co. Armagh Deceased and one of the executors of the last will and testament of the said Archibald McCULLAGH deceased of the one part & John McCULLAGH of the other part. Whereby the said Grizel McCULLAGH in consideration of 5s paid to her did convey to the said John McCULLAGH .. lands of Drumsallagh, Co. Armagh . Witnessed by Hugh McCULLAGH of Killylea & Robert CLARK of Lisnafiddy, both in Co. Armagh & Hugh McCULLAGH and John SCOTT both of City of Armagh yeoman. David McCULLOCH and Jane McCULLOUGH otherwise YOUNG his wife of town of Antrim & James McCULLOCH of Camoly Co Armagh… in consid of marriage – lands of Ballynickle. Belfast Newsletter March 23, 1754 Whereas his Majesty by his Letters Patent was pleased to grant unto James McCullough of Camoley in the County of Armagh, Esq. ; two fairs to be held yearly for ever at Culloville, being part of the lands of Cornecary, Corrakineony, Mongoleagh and Glassdrumaghy; situate in the parish of Creggan, Barony of Fews and County of Armagh: that is to say, one fair to be held on every 26th day of April, and one other fair to be held on every 26th day of October, and on the date next following each of the said days; as also a weekly market to be held in or at Cullaville aforesaid, on every Friday for ever. This is therefore to give notice, that fares will be accordingly held at the place aforesaid on the respective days aforesaid; and that a weekly market will be held there, on every Friday, as soon as proper accommodation can be prepared for those who may pleased to attend the same; and that the said fairs, and market are to be custom free for seven years from the date hereof. Part of the said lands of Cornacary is now to be let, and the other denominations above mentioned with several more will soon be out of lease. Application may be made to the said James McCullough at Carmoley aforesaid, who will give good encouragement to linen drapers yarn merchants and tradesmen of all kinds. ROD 179-73-118921 Much as above. Roger McMAHON of Mullaghbrack, Co. Monaghan & John BARLOW Esq. of 1st pt & Alexander McDONALD of Templetate of 2nd pt. Interest in lease of Mullaghbrack, Co. Monaghan, excepting house and garden. WITNESS: Fulk McCULLAGH; Felix McDONALD of Co. Monaghan & Meredith McCANN Schoolmaster of Co. Monaghan. NOTE: There may be a transcription error (perhaps mine) re: the name “Fulk”. McCULLOCH Jas to SHAW 1746-1758 NOTE: The index mentioned SHAW, but the memorial notes did not. McCULLOCH Anne, Henry & Jas to CRAWFORD. This is a marriage agreement concerning the marriage of Robert ALEXANDER & Ann McCULLOCH. Nathaniel ALEXANDER, Alderman of Londonderry to Robert ALEXANDER, 2nd son of Nathaniel ALEXANDER, intended groom £3000. Lands released by Henry McCULLOCH, Esq. of Ballyanton, Londonderry and by Henry McCULLOCH & James McCULLOCH, eldest son and heir in law of William McCULLOCH to James CRAWFORD of Crawfordsburn,, Co. Down & Robert McCLINTOCK, Esq. of Strabane, Tyrone to hold in trust for several uses. Henry McCULLOCH to pay £500 marr portion; Henry McCULLOCH released unto James CRAWFORD & Robert McCLINTOCK 2 messuages on n.side Bishops st Londonderry bnd on east [unnamed dissenting] on north by Meeting house yard on west by James COWDEN & ten't of Rev. John CONINGHAM - along with 60p of land on Island of Derry by on East by William HARPER + 212p on Island of Derry bnd on east by perches of Widow GIFFORD, Nathaniel ALEXANDER & Widow MORAN; on south by Thomas YOUNG + 24 p on s.side of rd to Colemore bnd on east by George GUNN on west by Frederick GORDON & Henry DIXON; for life of William DARCUS, 2nd son of Henry DARCUS of Londonderry, Henry DARCUS, 3rd son of Henry DARCUS & Robert DARCUS, 4th son of Henry DARCUS as demised by Society of G0__ [Goldsmiths?] & Assistants of London of new Plantation of Ulster to Nathaniel ALEXANDER. Robert ALEXANDER agreed if Ann McCULLOCH the younger, 2nd daughter of Henry McCULLOCH & Henry McCULLOCH to survive him, then his land to be charged with £50 annuity for Ann McCULLOCH during life of Ann McCULLOCH and Henry McCULLOCH; if Robert ALEXANDER to survive Ann McCULLOCH £2000 to the children; others such intents. Deputy Registrar: James SAUNDERS. WITNESSES: Jane McCULLOCH, spinster of Belfast, Co. Antrim; Samuel CURRY, merchant of Londonderry City; Henry McCULLOCH, servant; Mathew _EALY [MEALY? ], yeoman of Camoly, Co. Armagh; Luke _EALY [MEALY? ], yeoman of Camoly, Co. Armagh & John ECKLIN, Clerk of Drogheda, Co. Louth. Thanks to Mike Stewart for notes. James McCULLOCK… Henry M’CULLOCK of Ballyaarten Co Londonderry Esq of the 4th pt; Dorothea Beresford McCULLOCK daughter of Henry McCULLOCK of 5th pt, James McCULLOCK & James NESBITT of the 6th pt… Jane McCULLOCK eldest daughter of the sd Henry McCULLOCK of the 9th pt… marriage between James McCLINTOCK and said Dorothy Beresford McCULLOCH.. 500 pounds sterling.. lands in Co Tyrone. Mr. McCULLA was an adjacent occupant of house in St Nicholas Street, Dublin. McCULLAGH, Alexander - WALLACE see: 1766 Jun 10. NAMES: William McCULLAGH of Tullygalone; Alexander McCULLAGH of Tullyallen; John McCULLAGH; Patrick GIBSON of Crunagh; Robert McCALL; Joseph McGOWN of Keadybeg; Robert McCALLA; John SCOTT; William MOLINEUX; Thomas McCANN. Alexander McCULLAGH of City of Dublin, bricklayer & Rev Ephriam CUTHBERT of Drogheda of the other. Reciting deed of Dec 13, 1767 land in Corp of St Mary’s Abbey, Co & City of Dublin front to Earls St then called Henry St…. Marriage: John GRAVES jr of City of Dublin of 1st part; James DOBBIN & Henry BAMBRICK both of town & Co. Armagh of 2nd part & Mary McCULLOUGH of said town and Co. Armagh, spinster of 3rd part ... marriage shortly to be had between John GRAVES jr. & M. McCULLOUGH ... grant ... unto said James DOBBIN & Henry BAMBRICK ... 4 houses in tenements in Blanchford, Co. Dublin which John GRAVES the elder holds by lease. WITNESS: Robert SCOTT, Town of Armagh, apothecary & John MACARTNEY of Town of Armagh, merchant, both in Co. Armagh & John WILSON, Town & Co. Armagh; George WILSON formerly of Armagh. Marr art. Btw James McCULLOUGH of Ballynees in the proportion of Vintners Co Londonderry farmer of the 1 pt; & Francis DICKSON of Ballymacombe Co Londonderry farmer of other part. Marriage to be had btw John McCULLOGH son and heir to James McCULLOUGH & Sarah DICKSON eldest daughter of Francis DICKSON… half of his farm at Ballynees from James & Jane McCULLOGH (his wife) for son John McCULLOUGH… 40 pounds marriage jointure from Francis DICKSON. WITNESS: William DICKSON now of Coleraine & Morgan WILSON of Limnary & Richard DICKSON of Ballymacombe & John STEEL of Ballymacombe farmer. ROD 261-610-175298 NOTE: The registry numbers here seem to be incorrect. John McCULLAGH of Clady, Parish of Mullaghbrack Co Armagh of 1 pt & Robert McCULLAGH of same of other pt. Townland of Linnalea in Parish & Co Armagh 37A 1R English Stature Measure. WITNESSES: James LITTLE John KIRKPATRICK & Francis DUFFY. NOTE: Possibly the John McCULLAGH who died in Clady in 1787. He was the father of the John McCULLAGH who married Jane OLIVER, sister of Benjamin OLIVER. Robert McCULLAGH & David McCULLAGH son of Robert – Mullagheronk, Parish of Tullycorbet, Co Monaghan. Btw Thomas McCULLAGH of Gordonauld, Co Down Gent of 1 pt & Alexander McCULLAGH of Grey Abbey Mill in sd Co Down, Gent of other pt…. demised Gordonault ors Gortonal McNabbs lnd & Shandrum Meadow, Parish of Grey Abbey Barony Ardee Co Down. Anne McCULLAGH ors BETTRIDGE ors CORBETT. Of Swords, Dublin of 1st pt. Between Patrick McCULLAGH of Tullyvanus, Co. Monaghan of 1st part. Allen McCULLOGH of Tullyvanus of other part. Reciting that Alexander McCULLOGH late of Lurganear, Co. Monaghan cooper by lease date 8th May 1778 did demise to Patrick McBURNEY of Mulloghduff, Co. Armagh farmer all that part & parcel of land then in said Alexander’s possession with houses and offices thereon situate in said townland Lurganearly … for natural life of William [I assume McCULLOGH] & also reciting that said Alexander McCULLOGH by deed dated 20 May 1778 did assign to said Patrick McCULLOGH his the said Alexander McCULLOGH’s right title [?] land & the profits arising thereout … from 20 May for natural life of the said Elizabeth BAILIE the said deed 1 Oct 1778 thereon witnessed that the said Peter McCULLOGH for the consideration therein mentioned did assign and transfer to the said Allan McCULLOGH all his the said Patrick McCULLOUGH … lands of Lurganearly. WITNESS: Godfrey McCULLOUGH & Edward GLASSEY. Between William McCULLOGH of townland and Parish of Rasavan, Diocese of Connor, Co. Antrim of 1 pt. & Samuel McCULLAGH of same. Btw Dorothy Beresford McCULLOCH of Antrim in the Co of Antrim Widow mother of James McCULLOGH late of Camley, Co. Armagh Esq. deceased. Dr. William McCULLOGH the younger Dr. Henry McCULLOCH John MORTON and Dorothy Beresford MORTON otherwise McCULLOCH his wife Joseph WALKER and Jane WALKER otherwise McCULLOCH his wife. And Victoria McCULLAGH spinster.. Said William the younger, Henry, Dorothy MORTON Jane and Victoria are children of John McCULLOCH of Antrim afsd surgeon and Apothocary and nephews and nieces and some of the next of Kin of the said James McCULLOCH of the first pt.. William McCULLOCH the Elder of the City of Dublin Esq. only surviving brother and heir at law of the said James McCULLOCH of the 2nd pt, and the said John McCULLOCH of the 3rd pt…. the parties of the 1st pt quit claim for considerations unto the sd William McCULLOCH the elder… WITNESSES: William HOLMES, merchant; John CRAWFORD, Carpenter both of Town & Co Antrim. Memorial witnessed by William HOLMES and Robert YOUNG of Antrim merchant. James AIKIN of North St., Newry of 1st pt to James McCULLAGH of Lisnagade, Aughaderg, Co Down of 2nd pt for 10s per annum; tenement in North St Newry that AIKIN held from William CROSS deceased of Newry. A James McCULLAGH was a witness to the will of John MONTGOMERY of Aghnecloy, Co. Tyrone. Marr art. Btw James McCULLOUGH of Ballynees in the proportion of Vintners Co Londonderry farmer of the 1 pt; 7 Francis DICKSON of Ballymacombe Co Londonderry farmer of other part. Marriage to be had btw John McCULLOGH son and heir to James McCULLOUGH & Sarah DICKSON eldest daughter of Francis DICKSON… half of his farm at Ballynees from James & Jane McCULLOGH (his wife) for son John McCULLOUGH… 40 pounds marriage jointure from Francis DICKSON. WITNESS: William DICKSON now of Coleraine & Morgan WILSON of Limnary & Richard DICKSON of Ballymacombe & John STEEL of Ballymacombe farmer. James HAMILTON auctioned the Lands of Lisnagennell, Down, by virtue of a decree for the payment of a debt due to Alexander McCULLOGH by John & Catherine DICKSON of Lisnagennell. Bought for £1,350 by David BLEAKLY of City of Dublin Merchant in trust for Alexander McCULLOGH. Marriage article btw William STATIONER of 1st pt; Mary McCULLOH of the said City [city not mentioned] spinster 2nd daughter of Ann McCULLOH then late of Birr in Kings Co. deceased who was one of the sisters of Fenwick LYDDALL then late of Threadneedle Street London Gent deceased of 2nd pt; & Richard ASLY of said city of 3rd pt.. Fenwick LYDALL wrote his last will 9 Nov 1772 where he bequeathed his estate in Bershire… children of his 3 sisters Mrs. McCULLOH, Mrs. MASON & Mrs. SIMPLE…. PRONI D2489 Notes: William McCULLOCH red’d from Peter JACKSON £210 Deed 399.489.264507 19 Sept 1788 Between William McCULLOCH of Ballygilly, Co. Antrim Doctor of Physic & Peter JACKSON [Gent] of Steeple, Co. Antrim ... John McCULLOCH late of Antrim, apothecary., deceased. William McCULLOGH for consids releases unto Peter JACKSON half ten on s. side of street in Antrim above the church together with waste half ten adjoining other half ten - the whole called Lindsays ten + 11 acres Eng measure being part of field called Cotter's hill on left of road from Antrim to Carrickfergus for lives and rent as mentioned. Ann IRWIN formerly in occupation of part of field called Cotter's hill on left of road from Antrim to Carrickfergus. NAMES: Alexander WILSON of Dunraymond, Co. Monaghan and Aghavilly, Co. Leitrim; Thomas McCULLOUGH aka McCULLAGH of Derryvalley and Losset, Co. Monaghan; William BREAKEY of Drumskelt; James LECKY; Charles GILLESPIE of Arotuaghyt aka Ardaghy. Samuel McCULLOH of Dublin Carpenter of 1st pt. Deed of Sale between John M’CULLOUGH & Agnes McCULLOUGH wife of sd John McCULLOUGH of townland of Ballyrobin parish of Killead, Co. Antrim of the 1 pt. Sold land house & premises that they now enjoy in townland of Ballyrobin to David McCULLOUGH of Lisburn, & Co. Antrim afsd [sic] NOTE: It seems the couple had it as a marriage dowry. Btw James McCULLOGH of Knocknagney farmer and Mary McCULLOGH als BARBER als JACKSON his wife of 1st pt. sold to Rankin pt of Knocknagony late in occupation of James McCULLOGH & Mary his wife WITNESS: John JACKSON and Robert JACKSON both farmers of Knocknagoney. Charles SEAVER of Corcreaghan, Co. Down, Gent of 1st part & Robert McCULLOUGH of Ballybright [Ballybought? ], Co. Armagh Nailer of other part. Lease to McCULLOUGH of Ballybought Co. Armagh now in poassession of Robert McCULLOUGH & John NEILSON & undertenants on north side of the road leading into Newry “in as fee simple a manner was let to John MONTGOMERY of Canal Street, Co. Armagh, Merchant ... during natural lives of Robert McCULLOUGH, Mary McCULLOUGH orse [? ]lson [possibly NEILSON? WILSON?] his wife and Sarah McCULLOCH daughter to both and also during the life & lives. WITNESS: Robert CASSIDY of Newry, Co. Down weaver & Thomas COLE of Emyvale, Co. Monaghan Land Surveyor. Btw John McCULLOCH of Parish of Glassdummon Parish of Mullaghbrach Co Armagh & William BRYSON of Ballysallagh, Parish of Bangor Co Down in condid of 63.8.3 pd McCULLOGH transferred land on the West side of North St in town of Newtownards.. bounded on the north by #27 on the east with North St on the south with #2 and on west with Mary St.
James McCULLOGH of Altnamakin .. Revd Alexander McCOMB of Sizer Hill in 1793 demised to James McCULLOGH townland of Altnamakin 9a Irish measure. Parish of Newtonhamilton, Co Armagh…. Btw Patrick DEASE of City of Dublin Merchant & David McCULLOGH of City of Dublin Master Bricklayer of the other pt…. land east side of Upper Street to Ushers St.
James McCULLAGH of Altnamackin to David BOYD of same for £47.13.3 ½. Recites that Alexander McCOMBE of Ozier Hill 2 Nov 1793 let to grantor 9 acres plantation measure in Altnamackin for 3 lives Edward TIPPING of Bellurgan Park Co. Louth Esq. said Alexander McCOMBE & Alexander McCOMBE jr for ever at £2.13.3. Between Rev. Charles MOSSE, City of Dundalk surviving trustee … estate of Thomas TENISON of Rosefield, Co. Monagahan, Esq. .. (to be sold for part of debts) of 2nd part & James McCULLAGH of Shantenagh, Co. Monaghan Gent of 3rd part … whereby the said Charles MOSSE in consideration of £1280 pd by James McCULLAGH and by and with the consent of Thos TENISON … sell to James McCULLAGH … town and lands of Drummuck. WITNESS [?] Owen MITCHELL of City of Dublin attorney at Law & Philip WALTERS of Town & Co. Carlow. Dorothea Beresford McCULLOCH of Gardiner Place Dublin spinster of 1 pt… lands of Kilmore legally vested in William McCULLOUGH the younger of the City of Dublin deceased… all granted by Majesties Court to Dorothea .. dwelling house of Kilmore Barony of Coolock, Co Dublin. NOTE: There are 2 Dorothea Beresford McCULLOCHs. This one is likely named after her aunt who married John REED. Joseph WALKER of Ballymoney, Co. Antrim, Apothecary & Jane WALKER otherwise McCULLAGH his wife of 1st part. NOTE: Between William OLIVER of the City of Armagh Soap Boiler and Chandler of the one part and Jane McCULLAGH of Lissnamuddy in the County of Armagh of the other part ... the said Wm OLIVER did demise to the said Jane McCULLAGH all that part of the town and lands of Brootely in the County of Armagh in his possession held under the representatives of the late Robert MAXWELL Esq. By deed ... 53 acres English measure paying the rent yearly of £32 ... and did demise and grant to Jane McCULLAGH & his assigns all that dwelling house, office and garden in New Street in the City of Armagh held under the representatives of the late Wm. JOHNSTON, Gent which said leases and lands are held in perpetuity ... [hard to read] the said Wm. OLIVER did demise to her the said Jane McCULLAGH during her natural life. Yet nevertheless said Wm OLIVER is to have and receive all the rents ... of said premises during her natural life and after his decease the same is to go to her ... [hard to read] Richard WALSH of the City of Armagh Book seller & Mary OLIVER of Ennislare in said County. Witness: Richard WALSH. John RICHARD, Chandler. Between William OLIVER of the City of Armagh Soap Boyler and chandler of the first part and Jane McCULLAGH of Lisnasudy Co. Armagh of the other part the said Wm OLIVER did demise to the said Jane McCULLAGH all that part of the town and lands of Brootley In the County of Armagh in his possession held under the Representatives of the late Robert Maxwell Esq. deceased containing 53 acres English Measure paying interest yearly £32 Sterling did also demise, grant to said Jane McCULLOUGH and his [sic] assigns all that dwelling House Offices and garden in new Street in the City of Armagh held under the representatives of the late William JOHNSTON Gent of which said leases and lands are held in perpetuity which said indenture of the 8th day of July above…… .. Benj OLIVER of Ennislare in said County Gent. NOTE: There are other transcriptions echoing this. I believe that William OLIVER is the older brother of Jane McCULLAGH, and they are both siblings of Benjamin OLIVER (1765-1831). I suspect that by the time of his death, he had retired to the farm at Brootally. Dorothy Beresford REED orse McCULLAGH wife of John REED the younger of Ballymoyer, Co. Armagh & George ANDERSON of Newry… [?] Beresford McCULLAGH spinster of Dublin… lands of Camlagh & Tullyvallen, Upper Fews, Armagh…NOTE: very hard to read. NOTE: This is quite likely Robert McCULLAGH (abt 1749-1830) of Cladymore, brother-in-law of Jane OLIVER of Kearney Hill, Armagh. Lease Hugh McCULLA of Rathhill, Co Monaghan to John GREER of Cormagrally, Co Armagh; Comagrally and part of the school lands of Mountnorris. James MacCullagh, the eldest of twelve children, was born in the townland of Landahussy in the parish of Upper Badoney, Co. Tyrone in 1809. He was to become one of Ireland and Europe's most significant mathematicians and physicists. He entered Trinity College, Dublin aged just 15 years and became a fellow in 1832. He was accepted as a member of the Royal Irish Academy in 1833 before attaining the position of Professor of Mathematics in 1834. He was an inspiring teacher who influenced a generation of students, some of whom were to make their own contributions to the subjects. He held the position of Chair of Mathematics from 1835 to 1843 and later Professor of Natural and Experimental Philosophy from 1843 to 1847. In 1838 James MacCullagh was awarded the Royal Irish Academy's Cunningham Medal for his work 'On the laws of crystalline reflexion'. In 1842, a year prior to his becoming a fellow of the Royal Society, London, he was awarded their Copley Medal for his work 'On surfaces of the second order'. He devoted much of the remainder of his life to the work of the Royal Irish Academy. Recites John McCULLAGH deceased had tenement in Newry and farm in Drumnahare; His eldest son, James McCULLAGH of Banbridge was entitled to same and conveyed tenement in Dirty Lane als North street in Newry to Martha McCULLAGH of Ballanfoy, Co. Down Widow for £61 and farm in Drumnahare to Jane McCULLAGH, Widow of Drumnahare, Co Down. John McCULLA, farmer of Furnabraigh, Co. Londonderry and David ESPY, farmer, Laurafarn, Co. Londonderry. Mrs. Arabella GIBBES, daughter of Sir William BOWLEY; Sir William BOWLEY, late deceased; Witnesses: Robert MILLER, Attorney at law of Moneymore, Co. Londonderry & John CARGAN, serrantman to MILLER of Moneymore. Registrar: George GRIFFIN. Farm in Furnabrach, Londonderry [80.1.32 plantation] for £50 from John McCULLA to David ESPEY in ESPEY's poss for & during life of GIBBES or term of 6 years, whichever lasts longer, from 1 Nov 1807 sub to yearly rent therein, with proviso for redemption upon payment of £50 + interest. Btw Robert McCULLAGH sr. of Cladymore, Co. Armagh gent of the 1 pt; and Samuel McCULLAGH McCULLAGH of Cladymore sr aforesaid and John McCULLAGH sr of Kearney Hill both in Co. Armagh Gent and both brothers of Robert McCULLAGH of the other part. Reciting that the said Robert McCULLAGH was leased several real freehold and personal estates and properties consisting of Lands Tenements heritments in the towns and lands of Cladymore Carrickbreagh Letmacallen Drumorgan Leneylea Raven Hill and Kilbereery in Co Armagh and all money and securities for money to a considerable amt that said Robert McCULLAGH had a wife and six children by her then living, namely Margaret McCULLAGH sr. his wife John McCULLAGH jr, Samuel McCULLAGH jr and Elizabeth McCULLAGH Anne MCULLAGH Margaret McCULLAGH jr and Martha McCULLAGH and that said Robert McCULLAGH sr also had a natural son named Robert McCULLAGH jr and in order to make a settlement of his estates and properties between his said sons to secure portions for his said daughters and a jointure for his wife said Robert McCULLAGH senior vested all his said estates and properties in his said two brothers Samuel McCULLAGH and John McCULLAGH sr…..details of how it is to be parceled out. NOTE: John McCULLAGH of Kearney Hill was the husband of Jane OLIVER. the 79th year of his age. love and respect to departed worth. Mtg btw John McCULLAGH Rathdrumgan, Co. Armagh, farmer of 1 pt & Frances BARNES, widow of William BARNES of Grange, Co. Armagh farmer demised part of townland of Tievenacree cont 38 acres 36 perches in Parish of Derrynoose, Co. Armagh & a piece of land on Thomas St. City of Armagh cont 40 feet in front joining the late John MARSHALL’s tenement at a distance of 90 feet from the late John C___ns house with all the ground behind in a straight line to the late James McGURGANs now part of the late Arthur O’NEILs garden and also the dwelling house in Scotch St in the City of Armagh bounded on the east by a house lately built on the west by the entrance to William NICHOLLS yard on the north by the street and on the south by the yard at the rere of said house together with one half of the said yard and stable for rent payable throughout to hold to the said Frances BARNES… subject to redemption on payment of sum of 180 pounds sterling with lawful interest. WITNESS: Thomas CALDWELL, Merchant & Thomas APPLEBY Conveyancer. Robert McCULLAGH of Killeen, farmer, James CORRY, farmer, Elizabeth McCULLAGH otherwise CORRY his wife which said Robert and Elizabeth are children of John McCULLAGH deceased and the grandchildren of and two of the devisees named in the will of Elizabeth McCULLAGH deceased therein named John SIMPSON and Elizabeth McCILLAGH otherwise SIMPSON his wife.. John MARSHALL and Sarah McCULLAGH orse MARSHALL his wife and also the grandchildren and two of the devisees named in the will of said Elizabeth McCULLAGH deceased and Margaret McCULLAGH the widow of said John McCULLAGH deceased. … Elizabeth McCULLAGH had 16 acres 2 rood in Killeen, Parish & Co. Armagh. Held by lease from Arthur GRAHAM…. Between Samuel McCULLAGH of Cladymore Parish, Parish of Mullaghnabrack, Co. Armagh, merchant & Oliver LEE of City of Armagh (son-in-law) of said Samuel McCULLAGH … lands of Mowellan, lands lately in the possession of Samuel McCULLAGH [given over to LEE] 14 acres, Manor of Toaghy, Co. Armagh. WITNESS: Samuel TAYLOR & Samuel McCULLAGH both of Cladymore. John JACKSON of Larne, Co. Antrim, carpenter of 1 pt. & Samuel ALEANDER of Larne, saddler …land in the town of Larne on the North side of the street leading to Mill from new Town, … parish of Larne. WITNESSES: Miles ATKINSON, merchant; William McCULLOCH, Doctor of Medicine, both of Larne, Co. Antrim. BNL 1832 Feb 17: At Rahans near Carrickmacross in the 9th inst, in the 75th year of her age, DOROTHEA BERESFORD UPTON REED, wife of John REED Esq., and grand-daughter and heiress of the late Wm. M’Culloch of Redmont [ sic Piedmount] , in the Co of Antrim, Esq. Mrs. Reed having died without issue is succeeded, as heir at law, in her valuable estates in Co Armagh, &ct by her cousin John Shaw M’Culloch of the town of Drogheda. NOTE: I suspect that Redmont should be Piedmont. Dorothea B. REED [aka Dorothea Beresford REED] died 1832 (Creggan Burials) age 80. NAMES: Rev. Andrew McCULLAGH aka McCULLOGH of Caledon; Marianne FISHER of Caledon; Robert McCULLOGH of Killnamuddy; Thomas McCARTER of Newbliss; Robert FISHER of Monree; Robert HAWTHORNE of Tandregee; Sarah FISHER of Monree; Richard TROTTER. NAMES: William McCULLAGH of Dundalk; James BEATTIE, Rev of [Knockakean?] Lodge, Co. Armagh; Samuel BRADFORD of Cavananore; Samuel BRADFORD late of Dundalk; Bridgit McKENNA; John NICHOLSON; Edward TOWNLEY; William Robert ROGERS; William HILL; John TOWNLEY; Lucas SHERLOCK. This headstone, erected by his sister and nephew, is a memorial to John Reed, Rahans, near Carrickmacross. John Reed was a landlord and magistrate. He married the niece of Captain James McCullagh, Camlymacullagh, and owned part of the McCullagh estate. There is another memorial to him in Donaghmoyne Parish Church which reads. "In loving memory of John Reed Esqr of Rahans for many years churchwarden of this parish. This table was erected by his brother James and Willian Reed". "Sacred to the memory of John Reed of Rahans Esqr who departed this life 4th June 1860 in the 91st year of his age. This stone is erected by his sister and nephew in memory of the great love and deep respect in which he was deservedly held not only by them but by all with whom he was connected. 'Blessed are the dead which lie in the Lord from henceforth.. yea saith the Spirit that they may rest front their labour. PLV XIV 13". James REED of Rahans d. 1877 May 5 – age 42 [b. 1835]. Probably related to the John Reed who was a landlord and magistrate. John REED married the niece of Captain James McCullagh, Camlymacullagh, and owned part of the McCullagh estate. There is a memorial to him in Donaghmoyne Parish Church which reads. In loving memory of John Reed Esqr of Rahans for many years churchwarden of this parish. This table was erected by his brother James and William Reed. NOTE: Related to Dorothea REED (d 1832).